Bonne Bouche: A "Tasty Morsel" from Vermont! Bonne Bouche is no ordinary cheese. Hand ladled and ash-ripened, the cheese is round – resembling brie – contrary to the logs of goat cheese more prevalent in the United States. Introduced by the Vermont Butter and Cheese Creamery in 2001, this cheese is extraordinary. Bonne Bouche means “good mouthful” or “tasty morsel” in French. When you taste it, you, like many, may be skeptical that a goat cheese of such quality could possibly be made in the U.S., but Vermont artisan cheeses now rival those produced in Europe. Not surprisingly, Bonne Bouche won instant acclaim nationally among food writers, retailers and chefs. The first year it was introduced, it won first place for aged goat cheese at the American Cheese Society competition. Vermont Buttery and Creamery cheeses are considered “fresh-ripened” cheeses. 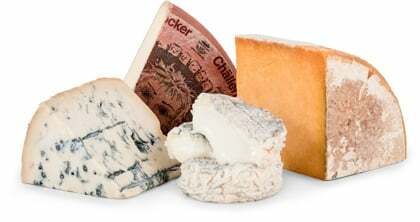 This mean they are young, soft cheeses, high in moisture and have delicate rinds. They need to be stored in a cold area of your refrigerator like the meat or vegetable drawer. Keep your Bonne Bouche in its micro-cave until you plan to serve it. The wood crate acts as a wick to absorb moisture away from the rind and to maintain moisture in the cheese. Slide a knife under the rind so it doesn’t stick to the wood. It is easier to remove the cheese from the crate when it is still cold and hard. At room temperature the rind becomes sticky and very fragile making it difficult to remove without damaging it. If the cheese is too soft for your taste, remove the film and leave it overnight in the refrigerator to dry the surface of the cheese. 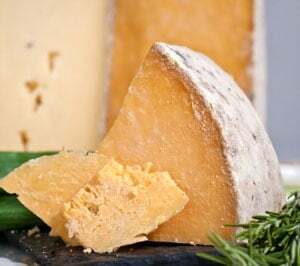 The next day leave the cheese at room temperature for at least two hours before serving. The rind will be dense of flavor and the paste will be sweet and creamy. If you prefer an even drier cheese to grate or marinate, let the cheese dry up to a week in the refrigerator. If you have leftover cheese, wrap it in its wood crate with regular plastic wrap. If you have thrown away the crate, a small plate will do. Make sure the wrap is not too tight so the cheese keeps breathing. Waxed and parchment paper are also good materials for wrapping artisan cheeses. Bonne Bouche can be aged up to 45 to 50 days if stored in the right temperature and humidity conditions. If you keep it too cold, (30-35°F) the active organisms stop working and the maturation is interrupted. If it’s too warm for too long – room temperature for more than two days – then it will be too runny and will likely develop a very pungent smell. Many of you are no doubt familiar with the flavor of goats’ milk cheese. Bonne Bouche, with 21% butterfat, has a texture that’s smooth and very creamy, and the rind is sweet and mild for an overall fresh flavorful goats’ milk cheese. Notes of fresh flowers, citrus and hazelnuts predominate. The wooden box in which Bonne Bouche is packaged is not only designed to protect the cheese, it creates its own micro-cave to help the ripening continue. Enjoy your Bonne Bouche right away or in the next 45 days. The younger the cheese, the milder the cheese; though even young, the cheese will still be slightly acidic. As it ages, your tasty morsel will become softer, the rind more dry and the flavor more piquant. Perfect with a dry white wine such as sauvignon blanc or pinot grigio. caves of Valsassina…all in one shipment!